Divers can verify the ratio of oxygen to nitrogen in their nitrox tanks with a portable analyzer, though as you might expect, they aren’t exactly cheap. But if you’re confident in your own hacking skills, [Eunjae Im] might have the solution for divers looking to save some cash. 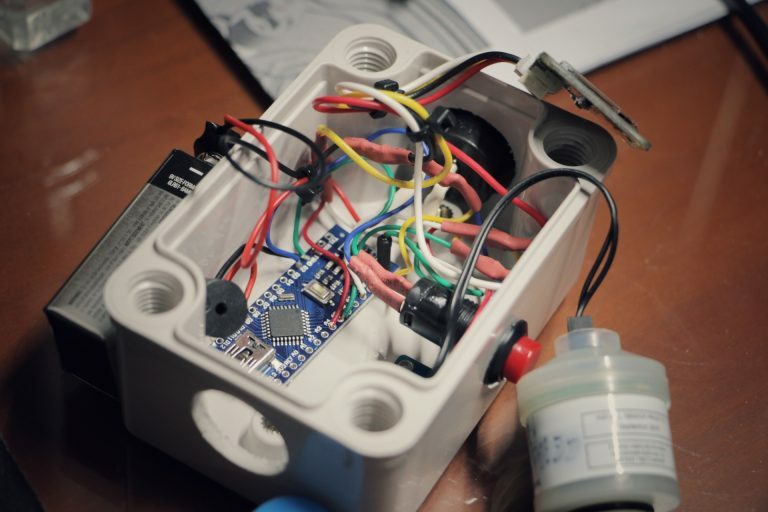 He’s come up with an Arduino based nitrox analyzer that can be built for considerably less than the cost of a commercial unit. Now before you get the torches lit up, we should be clear: ultimately the accuracy, and therefore safety, of this device depends on the quality of the oxygen sensor used. [Eunjae] isn’t suggesting you get a bottom of the barrel sensor for this build, and in fact links to a replacement sensor that’s intended for commercial nitrox analyzers as a way to verify the unit is up to the task. The downside is that the sensor alone runs $80. If you want to go with something cheaper, you do so at your own risk. With a suitable sensor in hand, the project really boils down to building up an interface and enclosure for it. [Eunjae] is using an Arduino Nano, a 128×64 OLED screen, and a battery inside of a rugged waterproof case. He also added an ADS1115 16 Bit DAC between the oxygen sensor and the Arduino for fast and accurate readings over I2C. With the hardware assembled, calibrating the device is as simple as taking it outside and making sure you get an oxygen reading of 20.9% (the atmospheric normal). While [Eunjae] is happy with his analyzer on the whole, he does see a few areas which could be improved in future revisions. The case is bulky and rather unattractive, something that could be addressed with a custom 3D printed case (though waterproofing it might be an issue). He also says the only reason he used a 9V alkaline battery was because he had it on hand, a small rechargeable battery pack would be a much more elegant solution. We’ll go out on a limb and say that most Hackaday readers aren’t avid scuba divers. For better or for worse, we’re the sort of folks who stay in the shallow end of the pool. But when one of our ilk does dip below the waves, they really seem to go all out. Running around while dousing each other with Super Soakers and screaming in delight is de rigueur on suburban lawns on hot summer days, but if you build this giant replica of a Super Soaker that can double as a pressure washer, you might have the upper edge on the neighborhood gang. You may remember [Mark Rober] from such projects as his bullseye-catching dart board and his previous entry in the awesome uncle of the year awards, the fully automatic snowball gun. We’re not entirely sure that this seven-foot long replica of the original Super Soaker will win him any uncle or neighbor plaudits, given that it the stream it produces is not far off of what a pressure washer can manage and can literally slice a watermelon in half. Fortunately, [Mark] included swappable nozzles to reduce the pressure enough that relatively safe dousing is still on the table. The housing is a pretty accurate plywood and foam replica of the original toy, but the mechanism is beefed up considerably — a pair of nitrogen tanks, some regulators, and a solenoid valve. See the gun in all its window-smashing, kid-soaking glory in the video after the break. We realize [Mark]’s build is just a fun way to beat the heat, but it gives us a few ideas for more practical uses. Maybe a DIY water-jet cutter that’s not built around a pressure washer? The reason we can feed six or seven billion people isn’t GMOs. It’s the massive increase in the use of fertilizers over the past hundred years. Most of the nitrogen-based fertilizers are produced using the Bosch-Haber process, a bit of chemical engineering that consumes one percent of all energy worldwide. 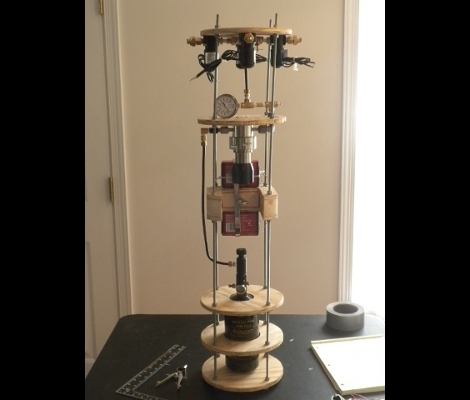 For his entry in the Hackaday Prize this year, [Peter Walsh] is improving the Bosch-Haber process, making the production of nitrogen simpler with less equipment. The Bosch-Haber process runs at temperatures 400°C and pressures of about 200 atmospheres. Right now, this process is run in huge pressure vessels. [Peter]’s idea is to use ultrasonic cavitation to produce the same environment in equipment that can sit safely on a workbench. [Peter]’s idea is inspired by sonoluminescence, a phenomenon seen when tiny bubbles in water implode producing light. It’s estimated that pressures and temperatures inside these imploding bubbles reach 2000 atmospheres and 5000°C – more than enough for the Bosch-Haber process. By injecting hydrogen and nitrogen into a machine that creates these sonoluminescent bubbles, ammonia will be created and turned into fertilizers to feed the planet. As far as DIY cryogenics are concerned, dry ice is easy mode. You can get frozen carbon dioxide at WalMart, or from a nozzle that screws onto a CO2 tank. It’s all very ordinary, and not really special at all. Want to know what’s cool? Making liquid nitrogen at home. [imsmooth] is getting his nitrogen from a standard tank, sending the gas through a CO2 and H2O scrubber, compressing it, putting the compressed gas in an ice bath, and slowly diffusing the compressed, cooled gas into a vacuum reservoir. When the cold compressed gas is released into the reservoir, Boyle’s law happens and liquid nitrogen condenses in a flask. As far as materials and equipment are concerned, [imsmooth] is using a PVC tower filled with zeolite to filter out the CO2 and H2O, a SCUBA compressor (no oil), and an almost absurd amount of stainless steel tubing for the precooler and regenerative cooling tower. Except for a few expensive valves, dewar, and the SCUBA compressor, it’s all stuff you could easily scrounge up from the usual home improvement stores. [imsmooth] is producing about 350cc/hr of liquid nitrogen, or more than enough for anyone who isn’t running an industrial process in their garage. Check out the video of the build below. If you’ve got some time to scour eBay and $500 sitting around you can build your own liquid nitrogen plant. [Ben Krasnow] figured it all out for you and estimates he can produce a liter of the stuff for around $1.15. The process depends on a membrane to separate nitrogen from the other materials in the air around us and a cryocooler to get the gas cold enough to condense into a liquid. Other than atmospheric air, you need to pump in electricity. About 9.6 kWh per liter… yikes! Is your human hair solar panel up to that? Anyway, once you’re up and running you can make yourself some ice cream or possibly save the world from oily destruction.